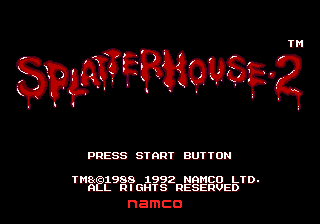 Splatterhouse 2 or Splatterhouse Part 2 (スプラッターハウス PART2) is the sequel to Splatterhouse(the first game was not released on a Sega platform) and was released exclusively for the Sega Mega Drive in 1992. Its sequel, Splatterhouse 3 would also be a Mega Drive exclusive. Three months have gone by since the events of the first game. The Terror Mask, which has reformed after breaking at the climax of the first game, appears to Rick and repeatedly tempts him to "go back to the house", telling him that Jennifer "doesn't have to die". It closes by telling Rick "You need me". The Japanese version doesn't features a password system (it have a limited number of continues instead), both English and Japanese text for the cutscenes and the mask have a shape of a theatre one. Main article: Splatterhouse 2/Magazine articles.